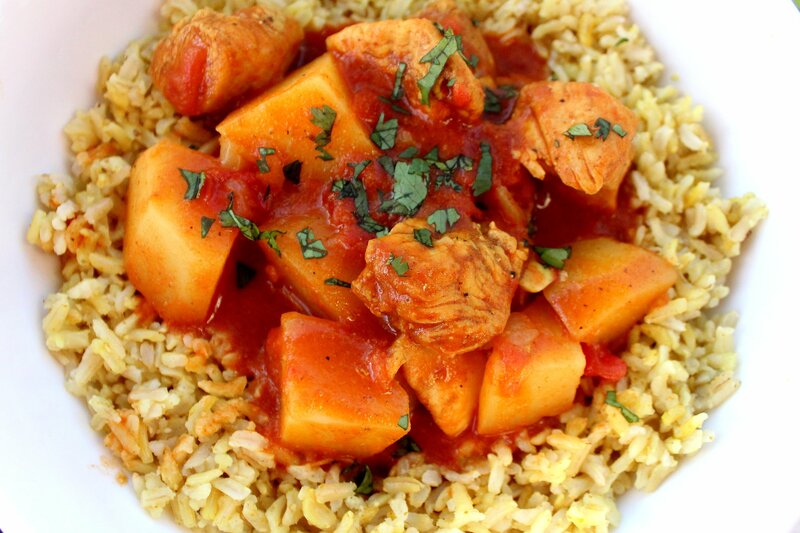 Chicken Potato Curry is a delicious bowl of Indian flavors! Sauteed chicken and perfectly cooked potatoes in a creamy tomato curry sauce. Great for a beginner to Indian food! Weight Watchers friendly recipe- 7 SmartPoints! A few years ago, I finally decided to try Indian food. MAN, I wish I would have tried it sooner because it is GOOD! What I love most about curry, besides the spices, is that curry is so versatile. You can make curries that are Indian inspired or Thai inspired. You can make curry with meat OR vegetarian! When I want meat in my curry, I always go for my Chicken Potato Curry recipe. This is a Weight Watcher friendly recipe and it’s only 7 SmartPoints per serving. 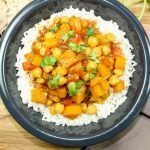 My favorite type of curry is Indian and this recipe is my go-to curry recipe especially because I can make this curry without spending all day in the kitchen. I’ve made curry quite a few times, and this recipe is definitely my favorite. It’s healthy but full of flavor. My husband put this on the repeat meal list, which I’ll take as a good sign. Chicken Potato Curry is great because it’s basically a one-pot dish; less clean up always makes for a more enjoyable meal. One way to speed up the cooking process is to do the prep work before you actually start cooking. Cut up the potatoes, chicken and onions into 1/2 to 1 inch pieces then set the aside so they are ready to throw into the skillet. Once all the ingredients are blended in the skillet, you basically just have to reduce to simmer, cover, and patiently wait! That’s it! Serve over rice or quinoa if desired. 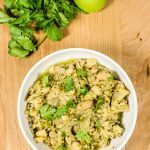 Chicken Potato Curry is a delicious bowl of Indian flavors! 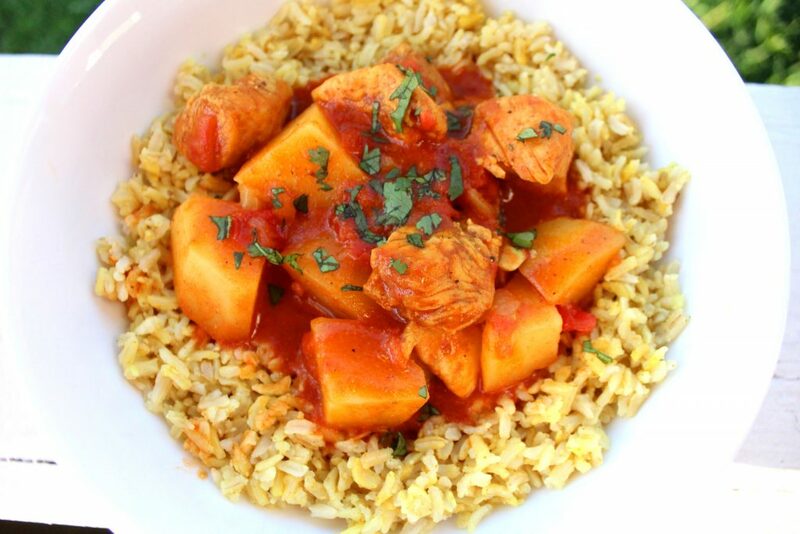 Sauteed chicken and perfectly cooked potatoes in a creamy tomato curry sauce. Great for a beginner to Indian food! 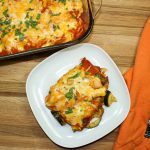 Weight Watchers friendly recipe and 7 SmartPoints per serving! Love Indian food? Be sure to try my other Indian Inspired Recipes! Cut chicken breast into 1/2 inch cubes, season with salt & pepper then set aside. Cut peeled potatoes into 1/2 inches cubes then set aside. Slice onion into thin 1/2 inch strips, diced garlic then set aside. Mix curry powder and coconut oil in a small bowl until well combined. Heat a large skillet on medium-high heat for one minute, then add curry oil mixture. Heat for one minute. Add onions and garlic into the skillet and heat until onions are translucent. Add chicken to skillet and mix well with other ingredients. Add coconut milk, tomato sauce, diced tomatoes (with liquid), and potatoes to skillet. Stir until well combined. Reduce heat to simmer, cover, and cook for 45 minutes. Add rice and water into pot and bring to a boil. Add a dash of curry powder and stir. Reduce heat to simmer, cover with lid, and cook for 40 minutes. Once cooked, fluff rice with fork. Scoop 1/4 cup rice and 1/2 cup curry into bowl. 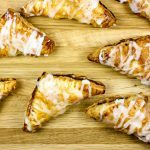 July 8, 2016 at 10:20 pm I'm making this one tonight. So far so good. It smells delicious! July 9, 2016 at 9:57 am Thanks for commenting Kristin! The curry smell is one of my favorite reasons to make this dish. I hope you enjoy! !